Choosing the best complementary colors for your curtains and area rugs is essential to creating an attractive decorating color scheme. This is a guide about curtain and rug color advice. I have burgundy walls, oak flooring, and dark grey furniture. Any suggestions for rugs or curtains? I'd use very light grey for the draperies. I wouldnt use a carpet, but rather highlight those beautiful floors. I would use a light green or a tan color!! I wold look for a carpet that is a dark green jewel tone( such as emerald) that has, either the burgundy from the walls, or possibly a pattern of small dots in jewel tones worked into it. This will brighten the look of the walls and furniture. For the curtains I would do either the color of the furniture, or pull one of the colors from the carpet, this will tie it all together. I would also place some throw pillows on the couch that either match the walls or the emerald of the carpet. I wish you good luck! Sigh, I wonder if I could talk my hubby into redecorationg!!! Perhaps moss and fern greens and soft gold would work well with this combination? It sounds lovely, restful and quiet. We just bought a new living room set. It's called Bella from Bernie and Phyl's and I've added a pic of the swatches. The couch has reversible cushions. The living room isn't very big and there is not a lot of sunlight, so I want to put sheers in the windows. I need help on what color to paint the walls, color of curtains, and what color rug? Take the swatches with you and compare them to paint and rug colors. Myself I think it looks like beiges, greys, or sages will work. If I were you I would use beige carpet, a matte goldish color for the paint on the walls that one would possibly see at an Italian restaurant, and pull out one of the richer colors for the curtains. It looks to be a beautiful piece! I would use the blue/gray or tan/cream for the walls and the other for the sheers, but not necessarily in a singular color. Look for ones that have a slight pattern or texture to them so they have some visual weight to blend with the furniture. 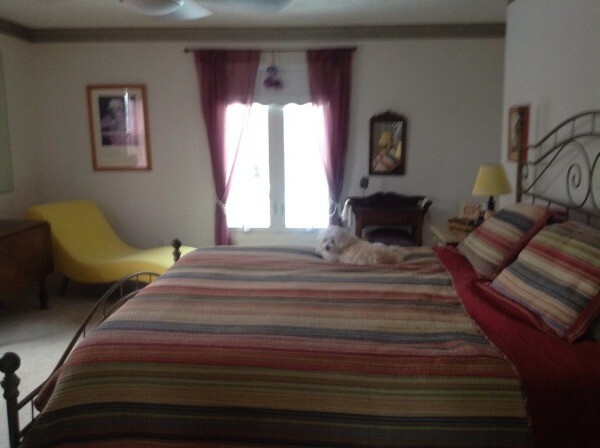 We have a large bedroom with adjoining bath and walk in closet. The walls are white, carpet beige, bedding reddish, beige, and multi colored stripes. There is also a bright yellow chaise lounge and yellow nite stand lamps. I plan on redoing everything at some point, but need some temporary inexpensive color changes until we can afford the whole makeover. My main problem is what color curtains and throw rugs to pull the beige floor, white walls, yellow accents and red/rust multi striped bedding together? I need to keep white walls for now. My current window sheers are a lavender - left over from previous comforter colors. Help! Love the coverlet. Windows. Lose the "cafe" shortie. Oops. Is that a white shade? Too white. Tone it down to the lightest cocoa in coverlet, or darkish beige. There are paints that work for vinyl. You only have to paint as much as you actually pull down for lazy mornings. One site, projectophile.net is good. 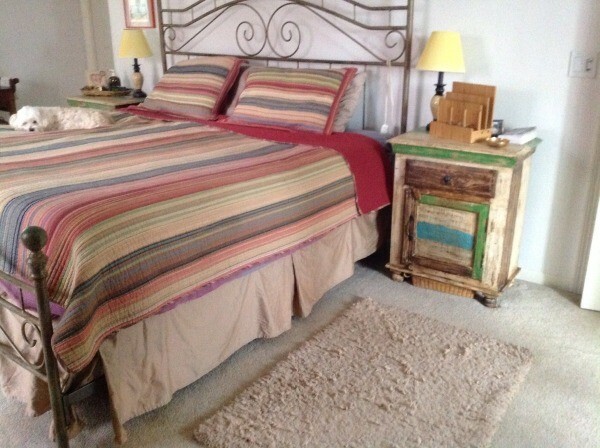 Get 2 cocoa full length panels, to the floor, (near the cocoa brown in coverlet). They go to the far sides of window then u can leave the "red" as if it sewn together. Do not tie back. Widen the rod to extend beyond the window so it looks bigger. The "right"red,a "throw" over back of yellow chaise and/or smaller rectangular pillow wrapped with the right colors clearance winter scarf. A darker cocoa or red/raspberry? rug or two. Or fun rag rugs with the right colors(cheap at places like Ollies or Big Lots. Even a bigger one partly under chaise/ under window. Personally I'd buy new lampshades. Even Marilyn Monroe didn't look good in yellow light. And please lower picture on left about 6" so the bottom of it is level with the one on right. I really like the bed style, bed cover and the room as it is except for the curtains and throw rugs. The furniture makes a statement in itself and is vibrant. I think I'd be tempted to forego curtains altogether and go with simple louvered white blinds and change the throw rugs to a color picked from the bed cover. Or lime green maybe? I once saw white louvered blinds where every third or fourth louver was painted green. It looked really smart. Lime green like what's in the night tables? Just an idea. 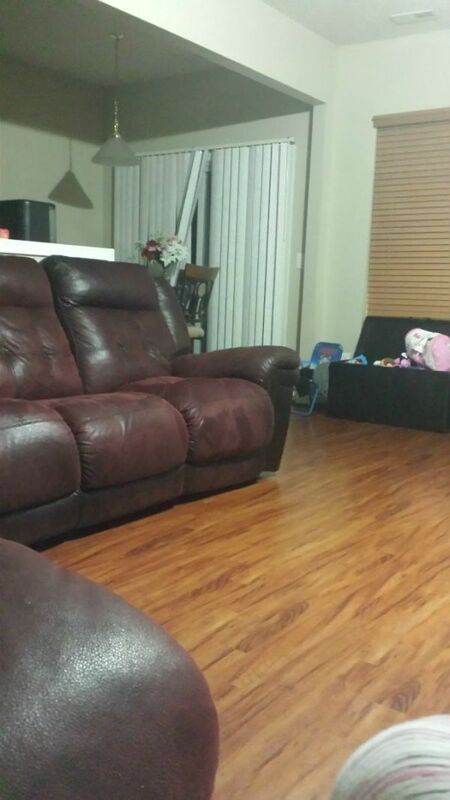 I have a beige color wall and dark brown leather couch with dark wood floors. What color curtain and rug should I choose? My sofa is almost exactly like yours. We have a matching recliner and another chair which is beige leather. Because we are old and subject to falls I opted not to have any sort of carpet. My 1950s hardwoods look nice without the rugs. I have white pull down shades with a valance (which I made) of striped denim. The house we planning to buy has dark red quarry tiles on all downstairs floors. My settee is a taupe color; what colour curtains/rugs can I have with that? I am not that keen on reds really. Tan or light brown sheers would go nice with taupe sofa and red tiles... something neutral. Even a sage green. Best of Luck! I would go with tans and browns. There is no need for the red of the tiles to appear anywhere else, if you are not fond of the colour. 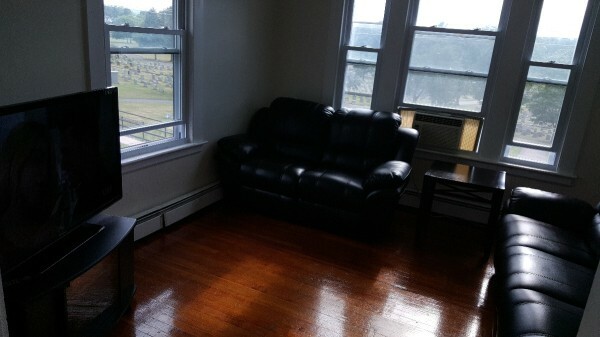 I have black leather couches, black TV stand, black end tables and coffee table and white walls in my new apartment. I am looking for another color to add to the room, some wall decor, area rug, and curtains. I have seen some cute white and gold throw pillows so I was thinking of black and gold, but I am not 100% sure. The coffee table is not pictured and I have white blinds, but haven't put them up yet. The black is bold. If you want to keep the bold effect, you could add gold, or red, or silver. If you want a more calm effect, you could use earth tones. The earth tones would work well whether you covered the hardwood floors, or not. I have light gray walls with white trim, gray furniture, and dark hardwood floors. I have gray, white, and yellow curtains now, but I need new ideas, I was thinking light blue for curtain panels. I have white black out ones as the main large curtains and panels on either side, but what about the rug color? I was thinking white. Does anyone have any ideas? I'm stumped on colors. With light gray walls you can always use a teal color. This will blend in nicely with your dark floors and furniture. Rust color is also a good idea for this combination. I am not so sure about a white rug on your floors. White attracts dirt quickly and will soon look bad. If you want to use a teal color for your curtains I would consider a teal and gray stripped rug for your floors. You can also add a few teal throw pillows on your couch to blend in the colors. I have a bright yellow color 5 seater sofa and white walls all over the house. The doors and French windows and rectangle coffee table are a mahogany color. Can you advise on what color curtains, cushions, and rug I can buy? Also we have a king size 4 poster bed with dark blue sheets and pillows and a 2 sided color red and dark blue quilt. Can you suggest the curtain color for the bedroom too please? Thank you. The color that comes to my mind first for your yellow/white combo would be an orange. And a vivid accent or two of a lime green. Those colors would certainly wake you up!! But I am all about bold, love the eye opening combos. Your bed and pillows are a bit harder. 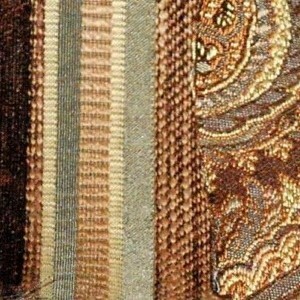 Since dark blue seems to be the dominate color, my suggestion would be to try to find a complimentary pattern (paisley?) using the red to bring it together. And black to accentuate. Just my ideas! Hope this helps in some way! My wall is painted both light pink and dusty rose, I have brown sofas. 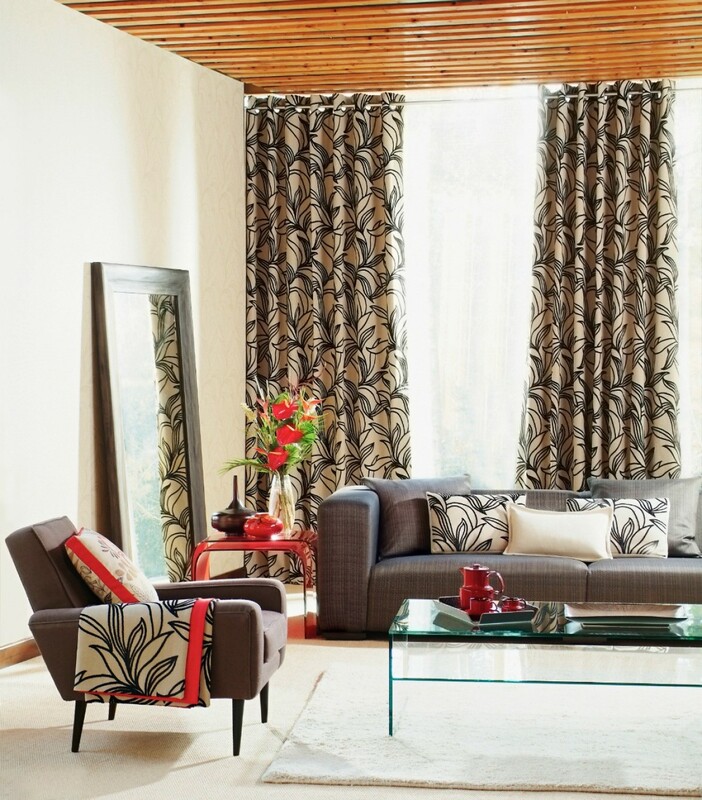 What colour curtains and rug should I buy?